On July 19, 2013, NASA's Cassini spacecraft will take a picture of Earth from about 898 million (1.44 billion kilometers) away, or nearly 10 times the distance between Earth and the sun. It will be the first time Earthlings have had advance notice that their picture will be taken from interplanetary distances. PASADENA, Calif. - NASA's Cassini spacecraft, now exploring Saturn, will take a picture of our home planet from a distance of hundreds of millions of miles on July 19. NASA is inviting the public to help acknowledge the historic interplanetary portrait as it is being taken. "While Earth will be only about a pixel in size from Cassini's vantage point 898 million [1.44 billion kilometers] away, the team is looking forward to giving the world a chance to see what their home looks like from Saturn," said Linda Spilker, Cassini project scientist at NASA's Jet Propulsion Laboratory in Pasadena, Calif. "We hope you'll join us in waving at Saturn from Earth, so we can commemorate this special opportunity." Cassini will start obtaining the Earth part of the mosaic at 2:27 p.m. PDT (5:27 p.m. EDT or 21:27 UTC) and end about 15 minutes later, all while Saturn is eclipsing the sun from Cassini's point of view. The spacecraft's unique vantage point in Saturn's shadow will provide a special scientific opportunity to look at the planet's rings. At the time of the photo, North America and part of the Atlantic Ocean will be in sunlight. 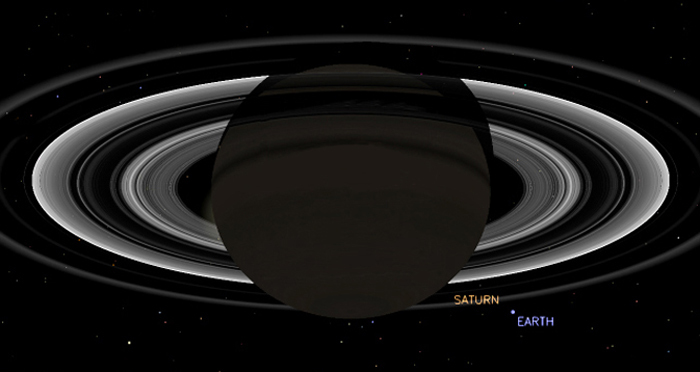 Unlike two previous Cassini eclipse mosaics of the Saturn system in 2006, which captured Earth, and another in 2012, the July 19 image will be the first to capture the Saturn system with Earth in natural color, as human eyes would see it. It also will be the first to capture Earth and its moon with Cassini's highest-resolution camera. The probe's position will allow it to turn its cameras in the direction of the sun, where Earth will be, without damaging the spacecraft's sensitive detectors. "Ever since we caught sight of the Earth among the rings of Saturn in September 2006 in a mosaic that has become one of Cassini's most beloved images, I have wanted to do it all over again, only better," said Carolyn Porco, Cassini imaging team lead at the Space Science Institute in Boulder, Colo. "This time, I wanted to turn the entire event into an opportunity for everyone around the globe to savor the uniqueness of our planet and the preciousness of the life on it." Porco and her imaging team associates examined Cassini's planned flight path for the remainder of its Saturn mission in search of a time when Earth would not be obstructed by Saturn or its rings. Working with other Cassini team members, they found the July 19 opportunity would permit the spacecraft to spend time in Saturn's shadow to duplicate the views from earlier in the mission to collect both visible and infrared imagery of the planet and its ring system. "Looking back towards the sun through the rings highlights the tiniest of ring particles, whose width is comparable to the thickness of hair and which are difficult to see from ground-based telescopes," said Matt Hedman, a Cassini science team member based at Cornell University in Ithaca, N.Y., and a member of the rings working group. "We're particularly interested in seeing the structures within Saturn's dusty E ring, which is sculpted by the activity of the geysers on the moon Enceladus, Saturn's magnetic field and even solar radiation pressure." This latest image will continue a NASA legacy of space-based images of our fragile home, including the 1968 "Earthrise" image taken by the Apollo 8 moon mission from about 240,000 miles (380,000 kilometers) away and the 1990 "Pale Blue Dot" image taken by Voyager 1 from about 4 billion miles (6 billion kilometers) away. The Cassini-Huygens mission is a cooperative project of NASA, the European Space Agency and the Italian Space Agency. JPL manages the Cassini-Huygens mission for NASA's Science Mission Directorate in Washington, and designed, developed and assembled the Cassini orbiter and its two onboard cameras. The imaging team consists of scientists from the United States, the United Kingdom, France and Germany. The imaging operations center is based at the Space Science Institute in Boulder, Colo.
On July 19, 2013, Cassini's cameras will be turned in the direction of the sun and will capture the Earth, alongside Saturn and its rings, in an event that will mark the first time Earthlings will know in advance their picture will be taken from a billion miles away. A full end-to-end mosaic of images of the ring system will be acquired over 4 hours on July 19. The Earth will be captured in a series of images taken between 21:27 to 21:42 UTC on that day, or 14:27 and 14:42 Pacific Daylight Time. LIGHT TRAVEL TIME IS ALREADY ACCOUNTED FOR IN THESE TIMES. This means you should be out and smiling, waving and celebrating at the indicated times, adjusted of course for your time zone. For people in the Pacific Daylight Time zone, that means 2:27 pm to 2:42 pm. Consider it the first interplanetary photobomb. On July 19th, NASA's Cassini spacecraft will photograph Earth through the rings of Saturn--and NASA wants you to jump into the shot. "Cassini has photographed Earth before, but this will be the first time Earthlings know in advance their picture will be taken from a billion miles away," says Linda Spilker, Cassini project scientist at NASA's Jet Propulsion Laboratory in Pasadena, CA. "We hope that people around the world will go outside to wave at Saturn while the photo-shoot is underway." Cassini's cameras will be trained on Earth during a 15 minute interval that begins at 2:27 p.m. PDT (5:27 p.m. EDT or 21:27 UTC). "I am excited about this rare opportunity to send photons of all of us waving at Saturn," adds Spilker. 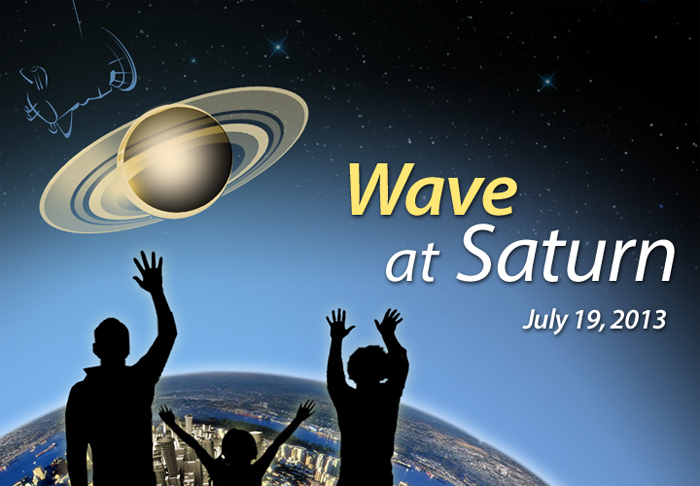 "I am encouraging my family and friends to wave at Saturn on that day also." The circumstances of this photo-op are extraordinary. From Cassini's point of view, the body of Saturn will eclipse the sun, so that the rings are magnificently backlit. Earth will appear as a tiny blue speck just outside the E ring. Opportunities to image Earth from the outer solar system are rare. Since the Space Age began, there have been only two images of Earth from the outer solar system. The first and most distant was taken 23 years ago by NASA's Voyager 1 spacecraft beyond Neptune. 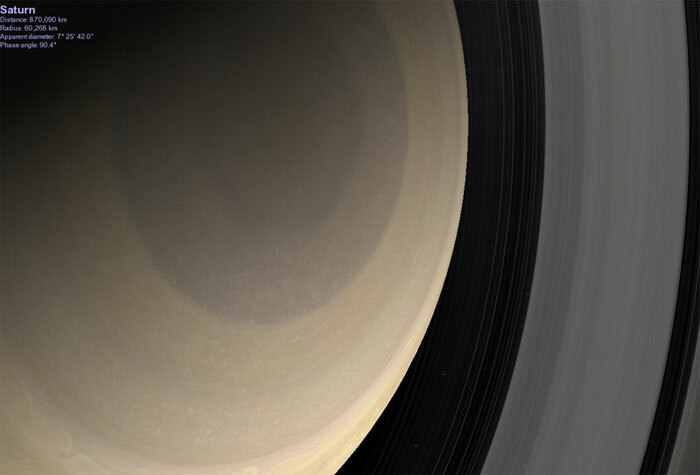 The second was Cassini's image from the Saturn system in 2006. Cassini's image of Earth in 2006 inspired Carolyn Porco, the Cassini imaging team lead at the Space Science Institute in Boulder, Colorado. "Ever since we caught sight of Earth among the rings of Saturn in September 2006, I have wanted to do it all over again, only better," she says. "This time, I wanted to turn the event into an opportunity for people all over the globe to celebrate together the extraordinary achievements that have made such interplanetary photo sessions possible." This photo-shoot will improve upon Cassini's previous effort in two ways: The July 19, 2013, image will be the first to capture the Saturn system with Earth in natural color, as human eyes would see it. It also will be the first to capture Earth and its moon with Cassini's highest-resolution camera. The Americas will be facing Saturn at the time of the image. For North Americans, the event happens in broad daylight, so the best way to participate is to go outside, face east, and wave at the blue sky. Go outside again after sunset. By that time, Saturn will have moved into the southwestern sky. It pops out of the twilight, a slightly-golden pinprick about twice as bright as a first magnitude star. Saturn is in the constellation Virgo, not far from the bright star Spica. If you have a telescope, point it at Saturn. Even inexpensive backyard optics will show you Saturn's rings and its biggest moon Titan. Observers who see Saturn for the first time through the eyepiece of a telescope often gasp. The view is Hubble-esque, but the experience is much more personal. You’re seeing Saturn with your own eyes, a celestial wonder right out of the pages of an astronomy magazine. From Cassini's point of view, Saturn's rings are too wide to capture in a single image, so the spacecraft will take a series of exposures. These will be combined on Earth to produce a breathtaking mosaic. 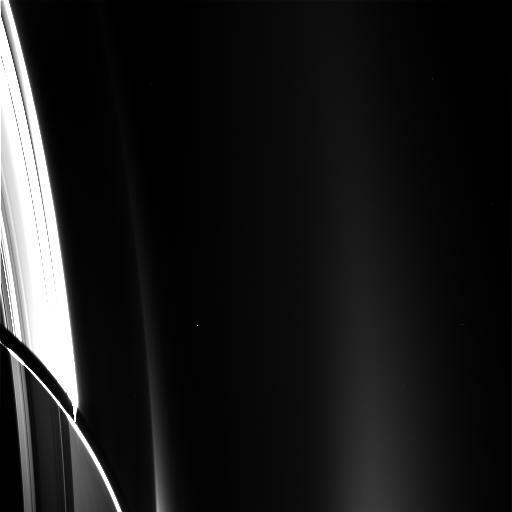 "Seeing the whole mosaic of the backlit rings when it is put together will be incredible," says Spilker. 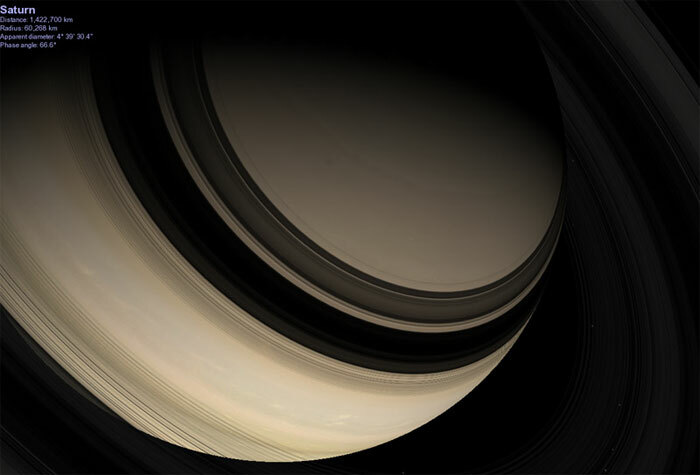 "We will be looking for changes in Saturn's faint rings, especially the E ring, from the mosaic we took back in 2006." The highlight of the day, however, will likely be our own planet. Says Porco, "It will be a day to celebrate life on the Pale Blue Dot." PASADENA, Calif. -- Two NASA spacecraft, one studying the Saturn system, the other observing Mercury, are maneuvering into place to take pictures of Earth on July 19 and 20. The image taken from the Saturn system by NASA's Cassini spacecraft will occur between 2:27 and 2:42 PDT (5:27 and 5:42 p.m. EDT, or 21:27 and 21:47 UTC) Friday, July 19. Cassini will be nearly 900 million miles (nearly 1.5 billion kilometers) away from Earth. NASA is encouraging the public to look and wave in the direction of Saturn at the time of the portrait and share their pictures via the Internet. The Cassini Earth portrait is part of a more extensive mosaic -- or multi-image picture -- of the Saturn system as it is backlit by the sun. The viewing geometry highlights the tiniest of ring particles and will allow scientists to see patterns within Saturn's dusty rings. Processing of the Earth images is expected to take a few days, and processing of the full Saturn system mosaic will likely take several weeks. Inspired in part by the Cassini team's plans to obtain a picture of Earth, scientists reexamined the planned observations of NASA's MESSENGER spacecraft in orbit around Mercury. They realized Earth is coincidentally expected to appear in some images taken in a search for natural satellites around Mercury on July 19 and 20. Those images will be taken at 4:49 a.m., 5:38 a.m. and 6:41 a.m. PDT (7:49 a.m., 8:38 a.m. and 9:41 a.m. EDT, or 11:49, 12:38, and 13:41 UTC) on both days. Parts of Earth not illuminated in the Cassini images, including all of Europe, the Middle East and Central Asia, will appear illuminated in the MESSENGER images. MESSENGER's images also will take a few days to process prior to release. W00083229.jpg was taken on July 20, 2013 and received on Earth July 20, 2013. The camera was pointing toward SATURN-ERING at approximately 623,956 miles (1,004,160 kilometers) away, and the image was taken using the CL1 and GRN filters. This image has not been validated or calibrated.